Oh no, that’s gonna need stitches. I don’t want to wait in the ER all night to get stitches. I can clean this up and fix it myself – it’ll be fine. At this point, the pain from my hand brought on by a gash soaked in lime juice had pretty much done in my appetite. I served the fish to the little guy and the wife, and she was thoughtful enough to put my fish in the fridge for later. We topped the fish with the salsa (minus the avocado, which wasn’t even ripe after all of this had happened), and no bed of cabbage, as I hadn’t gotten around to shredding it yet. They still enjoyed it despite the missing ingredients. Fast forward a few hours later. The pain had (somewhat) subsided, and I was getting hungry. I had cold salsa and a cold tilapia fillet in the fridge. I decided to break up the fish and mix it with the salsa. I added a little more lime juice, salt, black pepper and some fresh cilantro. I put it all in a bowl, tossed to combine and ate it up with some tortilla chips. This was a happy accident indeed… Could have done without the bleeding, though…. It may not be ceviche, but it was pretty tasty! Preheat oven to 450. Place tilapia on a non-stick cooking sheet. Cover with the juice of half a lime and season with salt, pepper and cumin. Place 2-3 pats of butter over the fish. Bake for 10-12 minutes, until fish is cooked through and flakes easily. 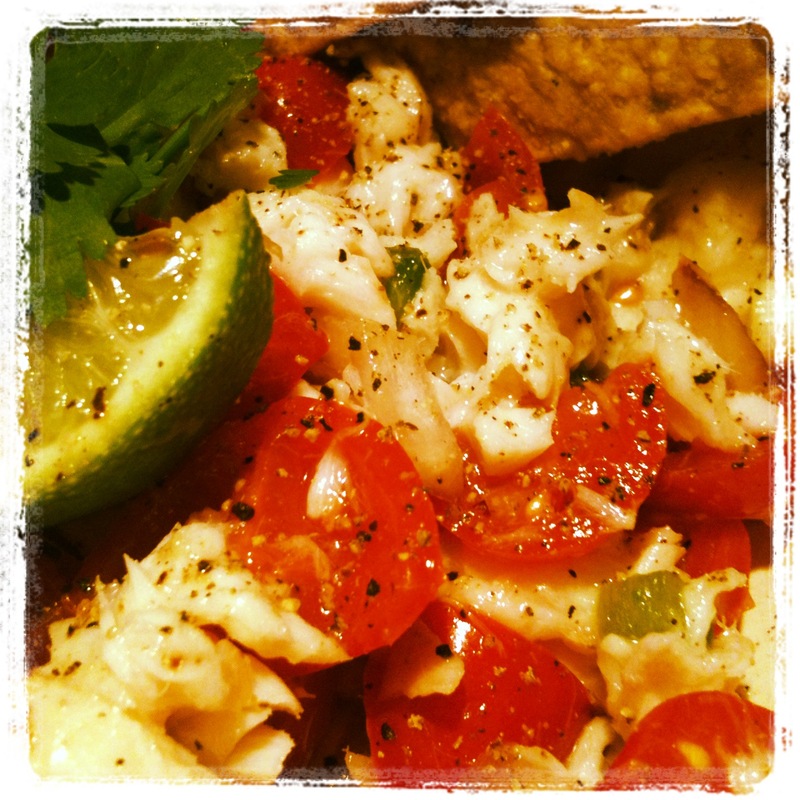 While your fish is cooking, CAREFULLY, dice the tomato, onion, bell pepper and avocado and add to a mixing bowl. Slice the white and green portions of the green onions and add them as well. Season with salt, pepper and then juice of one lime and toss gently to coat all the veggies with the seasoning and lime juice. Shred the cabbage either in a food processor or by hand (or use pre-shredded cabbage if you wish). Pull the fish out of the oven. Plate over a bed of shredded cabbage. Top with the fresh salsa. 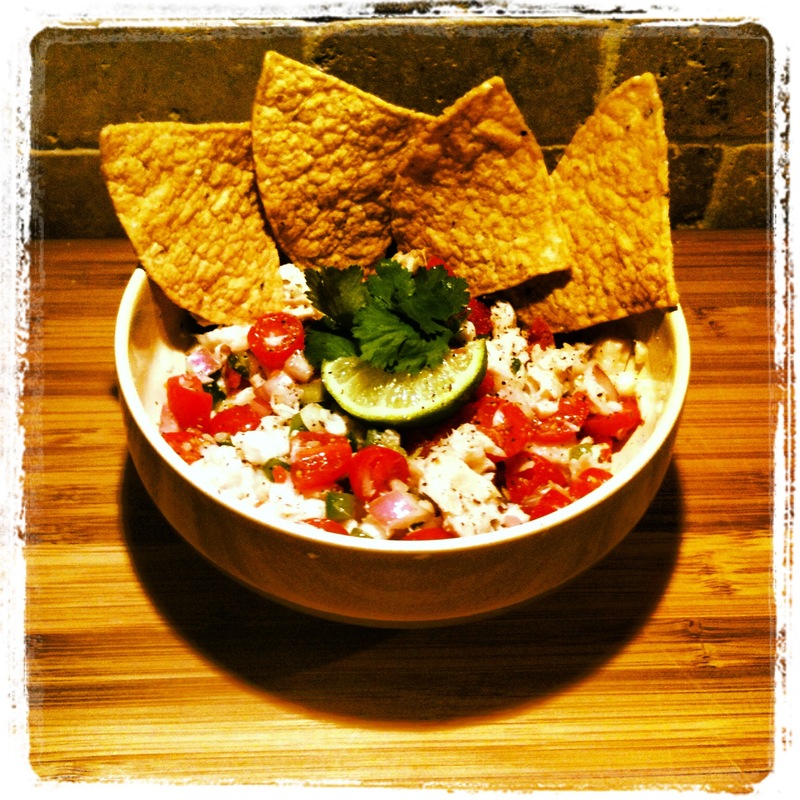 Garnish with fresh cilantro and serve with tortilla chips. See…would have been pretty tasty. I didn’t add any heat since I was making it for the whole family, but you could certainly add some jalapeno or serrano chiles to the salad for a little kick. Some day I will give this another shot, and I will definitely be more careful with my knife work. 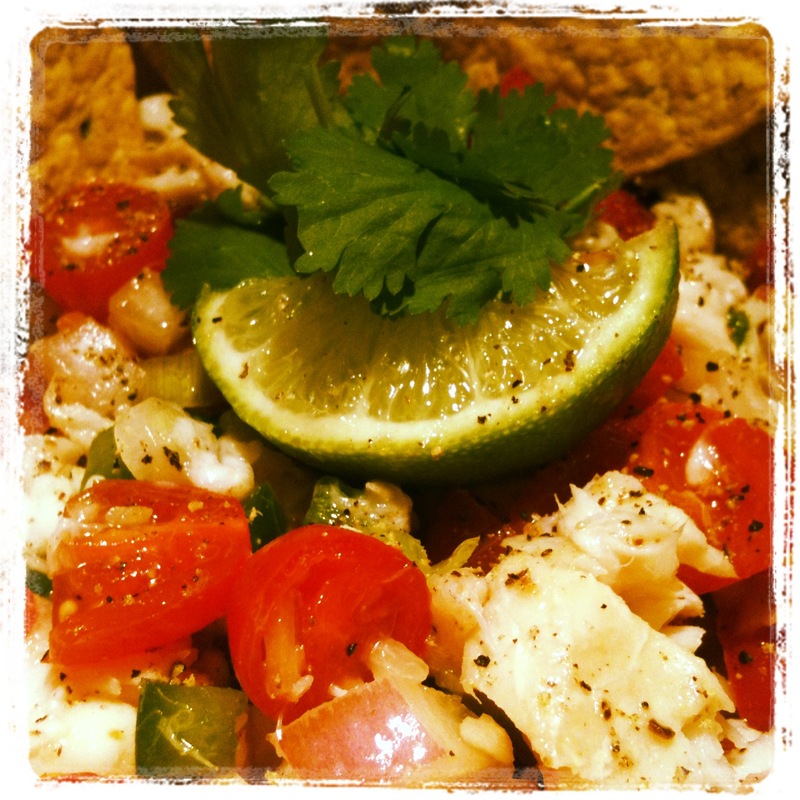 And, if you have leftovers…you can make yourself a nice pseudo-ceviche out of it. Great for a midnight snack or lunch the next day!